Episode Theme: Selfishness is a form of idolatry; putting yourself above the interest and needs of others. 1. Philippians 2:3 talks about selfishness. Give an example of how selfishness hurts a team, a family, a neighborhood, or a classroom. 2. In 1 Kings 21, King Ahab wanted what his neighbor Naboth had. He coveted Naboth's vineyard and pouted when he could not get it. Ahab’s wicked wife Jezebel killed Naboth and gave Naboth’s vineyard to her husband as a gift. Ahab got the thing that he wanted, but he didn’t think about Naboth or his family. When you really want something or desire to be number one, does it change how you treat other people? Think about how how you treat others as you listen to this episode. In this episode, Liz and Spike’s friendship is in trouble. Both lizards put themselves first—before their friend and their team. Each wants to be on top and doesn’t care what they have to do to win. In Matthew 20:20-28, the mother of two disciples, James and John, asked Jesus to give her sons a higher position than the rest of the disciples. She really didn’t know what she was asking. The rest of the disciples were angry, not because of the request, but because James and John’s mother had asked first. Jesus told all of them that to be great in his kingdom that you would have to be a servant to everyone! What does Liz bounce the basketball off of to perform the ghost maneuver? Why does Mateo say that talking to Liz and Spike is like talking to a brick wall? Because like a brick wall, they don’t listen. 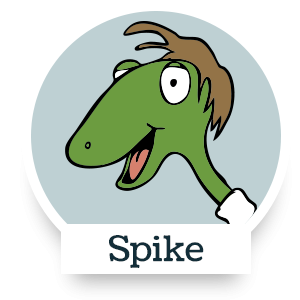 How does Spike cheat in the competition? He gets the photographers to take pictures with their flashes. Where and how is Spike trapped? On the side of the road, his foot is stuck in a storm grate. This week, make a favorite sandwich for each member of your family. If you’re not sure what people like, ask them. For dessert, set-up a sundae bar with different toppings. Have each family member make someone else’s sundae, creating the dessert according to the family member’s requests.